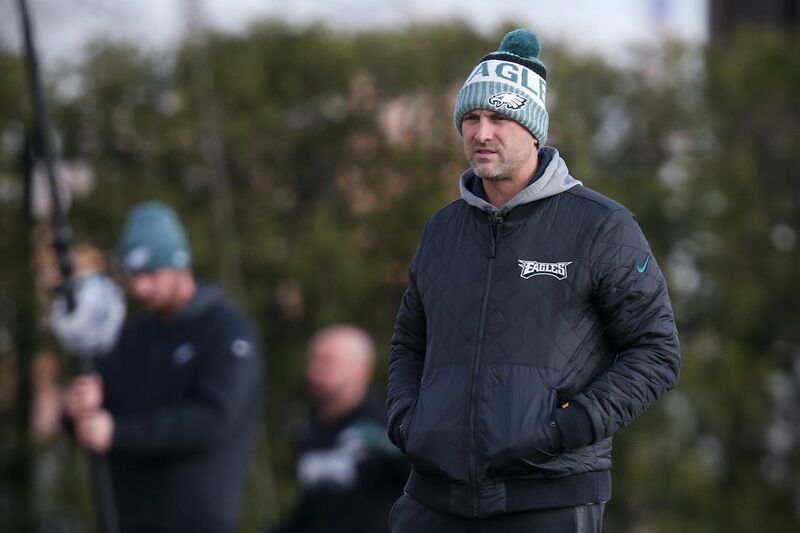 Eagles offensive coordinator Mike Groh watches practice at the NovaCare Complex in South Philadelphia on Thursday, Nov. 29, 2018. When Doug Pederson promoted Mike Groh in February he had as much capital as any Eagles coach in the last half century. He could have hired Chip Kelly as his offensive coordinator and few would have objected. But Pederson’s choice of Groh to replace Frank Reich, who had been hired as the Colts head coach only days after the Super Bowl and Josh McDaniels had shockingly spurned Indianapolis, was considered a sound move, if not an obvious one. While Pederson was the final word on offensive game plans and play calling, and Reich acted as his consigliere, Groh and the other assistants each had a voice. The Eagles’ approach was notably collaborative. And if Groh’s involvement was as a prominent as Pederson and Reich had said, then a change could be seamless. Reich, for instance, said in February that he had increasingly found himself walking into Groh’s office to bounce off ideas. There has been little evidence this season that promoting Groh from receivers coach to coordinator has been good. The Eagles offense which was among the NFL leaders in yards (seventh), points (third), third down (eighth) and red zone (first) last season, has been plodding along this season in the middle or bottom third in yards (19th), points (23d), third down (15th) and red zone (20th). Eagles offensive coordinator Frank Reich talks with rookie Carson Wentz during practice. But blaming Groh for the struggles, or at least placing him near the top of the list, would be like chiefly crediting Reich for the Eagles’ success in 2017. The buck stops with Pederson and there is no evidence to support the notion that he was a puppet for Reich. What is fair to question, however, is whether Reich’s departure, probably more than Groh’s ascension, has affected Pederson? The coach has understandably tired of Reich-Groh questions. But as the Eagles’ issues continue – an inability to start fast, run-pass imbalance, deep ball unproductivity -- and new ones crop up – integrating receiver Golden Tate into the offense – Groh has increasingly become a lightning rod for fan discontent. Reich, meanwhile, has the Colts winning after a slow start, and has their offense humming with a unit that is excelling in yards (tied for eighth), points (fourth), third down (first) and red zone (fifth). If there’s anyone who’s been exhausted more than Pederson by the comparisons, it’s Groh. The Eagles made only a handful of changes on offense this offseason. There were a few new faces, but the most significant alterations were Groh taking Reich’s spot and quality control assistant Press Taylor stepping into John DeFilippo’s role as quarterbacks coach after he left to become the Vikings offensive coordinator. The Eagles were prepared for DeFilippo’s departure. His contract was up and he wanted to become a coordinator. But Reich hadn’t even interviewed for a head coaching opening until McDaniels got cold feet and stayed with the Patriots. In a matter of days, DeFilippo left, followed by Reich. Probably. DeFilippo wanted to call plays and Pederson wasn’t relinquishing that responsibility. If the Eagles had hoped to go outside to find Reich’s replacement, they had slim pickings so late into the process. Only Groh and running backs coach Duce Staley were interviewed. But Groh’s experience with the passing game gave him an advantage. Pederson also liked that he had been a former quarterback. Groh played at Virginia and briefly for the Ravens and in Europe before working for his father, Al, as a coaching assistant, first with the New York Jets and then at Virginia. He rose all the way up to offensive coordinator until his father, losing and under pressure, fired him. He started over at Alabama as a graduate assistant for Nick Saban, one of his father’s coaching buddies during their days together with the Browns. Groh went from Alabama to Louisville back to Alabama to the Bears, before he landed with the Rams in 2016 as passing game coordinator/receivers coach. He didn’t call plays – Rob Boras did – but the Rams’ offense was the worst in the NFL. Jared Goff played in only the final seven games, but the rookie quarterback had the league’s worst passer rating. And when Sean McVay took over and coached Goff into becoming one of the NFL’s most promising young quarterbacks, even more criticism was directed at then-Rams coach Jeff Fisher’s staff. Groh hasn’t yet had autonomy over an NFL offense, but it’s not like he’s fetching Pederson’s coffee either. The role of coordinator, even if you’re not the one pushing the button, is vital. Pat Shurmur, now the New York Giants head coach, had a similar role when he worked under Kelly with the Eagles. Groh didn’t have to worry about helping to construct a new system. Pederson’s was already in place. There have been minor variations, as there is every season, but most of the heavy lifting in terms of scheme had been done. “We didn’t reinvent the wheel,” Ertz said. “It’s not like Mike came in and changed everything. It’s not like Press came in and changed everything. We’re still running the same plays we did last year. It comes down to players executing at the end of the day, myself included. But the week of game planning and preparation is instrumental on Sundays. Pederson and quarterback Carson Wentz said that they’re constantly meeting with Groh throughout the week as they fine tune the 150-200 plays they will have to choose from. Groh, 46, is typically front and center during daily offensive gatherings. He splits his time between the quarterbacks and receivers both on the field and in positional meetings. Reich had the advantage of having played in the NFL for 14 seasons, coached in it for an additional ten seasons and of having previously been a coordinator. Ten years Groh’s senior, he had great poise and an infectious positivity that affected nearly everybody at the NovaCare Complex. “Frank was just a great person to be around,” Talyor said. Wentz was asked recently if Reich’s calming influence was missed. Intense was a commonly used word to describe Groh, who has come off as defensive during news conferences this season – even well before the Eagles’ struggles. “He’s definitely intense,” Ertz said. “But I haven’t seen him waver by any means. Obviously, playing in this city is not always the easiest at times. But you could either use it two ways – take it sensitive or use it as a way to improve. Last week, Groh was asked if involving Tate in the offense had been more difficult than the Eagles had anticipated. He went onto qualify his initial response and say that not having enough plays had affected the entire offense. But few could get past admitting that he found it challenging to integrate a receiver who averaged more than 90 passes a season with the Lions into the system. Groh has declined to detail his role in the scripting of the Eagles’ first 15 plays, but like Reich, he meets with Pederson every night before the game for about an hour to go over the plan one last time and to exhale after the long week. Pederson once said those moments were the most he relished with Reich. Groh had big shoes to fill. Asked about that daunting task and subsequent public scrutiny, he fixated on the big picture rather than himself.